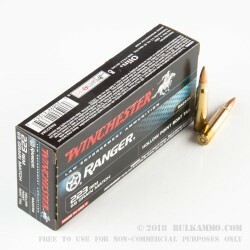 This 223 Rem cartridge by Winchester’s Ranger line of ammunition features a 69 grain MatchKing bullet. The projectile sports a boat tail, which stabilizes its flight and increases its ballistic coefficient. It further makes the cartridge easier to assemble, so it’s less likely to have incurred scratching at the factory that would have harmed its accuracy potential. 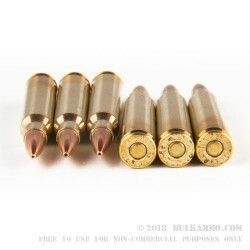 It additionally sports a hollow point, so it will expand devastatingly within targets. 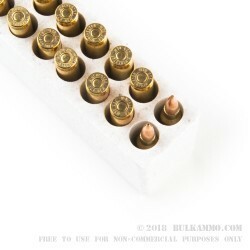 This cartridge also offers a non-corrosive Boxer primer in its brass casing, the most popular type of primer in America for its ease in reloading. 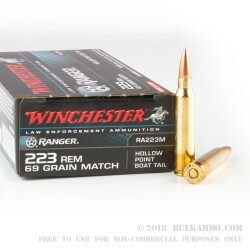 With its swift muzzle velocity of 3,060 fps, it’s no wonder why law enforcement professionals favor this round, but it’s a sure thing when used for varmints as well. It succeeds in the four layer denim ballistic gelatin test, so your standard coyote hide ought to give it no problems either.